The Simple English Wiktionary has a definition for: Europe. Europe is a continent. It is the western part of Eurasia. It is separated from Asia by the Ural Mountains in Russia and the Bosporus strait in Turkey. Europe is surrounded by water on three sides. On the west is the Atlantic Ocean. To the north is the Arctic Ocean. The Mediterranean Sea separates Southeastern Europe from Africa. There are more than 50 countries in Europe. Most of these countries are members of the European Union. 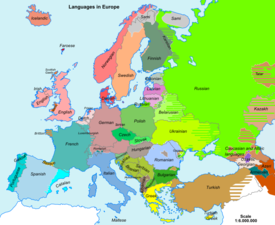 Europe covers about 10,180,000 square kilometers (3,930,000 square miles). This is 2% of the Earth's surface (6.8% of its land area). As of 2017, about 510 million people lived in Europe. Europe makes 44% of the world's wine. Europe contains the world's second most active volcano. Greenland, in Europe, Is the world's biggest island - considering Australia is a continent! Europe is a major tourist attraction. People come from all over the world to see its many World Heritage Sites and other attractions. Europe is named after a princess in Greek mythology called "Europa." The myth says that Zeus kidnapped Europa and took her to Crete, where she became the mother of King Minos (whom Europe’s first civilization derives its name, the Minoans, from). The name "Europa" was later used to describe Greece. Then, as the rest of modern-day. Europe started to have cities and empires, the entire area West of the Ural Mountains came to be called "Europa." The history of Europe is long and has many turns. Many great countries originated from Europe. Greek mythology and the beginning of western civilization came from European nations. Andreas M. Kaplan describes modern Europe as a continent where many different cultures live closely together, "embracing maximum cultural diversity at minimal geographical distances". Within these regions, there are more than 50 independent European countries. The largest is the Russian Federation, which covers 39% of Europe. The European city with the largest population is Istanbul. The country with the largest population is the Russian Federation. About 15% of Europeans live in Russia. Two European countries, the United Kingdom and the Republic of Ireland, are on islands called the British Isles. Most of Europe lies in temperate climate zones. However, there are many different climates throughout Europe. For example, during the winter, it may be snowing and -30 degrees Celsius for 4-5 months in Finland. Yet it may be much warmer, with no snow at all except on high mountains, in Spain. The European Union is a confederation of 28 European countries. These countries agree to follow common laws so that their citizens can move and trade in EU countries almost the same as they do in their own. Nineteen of these countries also share the same type of money: the euro. ↑ "Andreas M. Kaplan: European Management and European Business Schools: Insights from the History of Business Schools, European Management Journal, 2014".